How do you know when a classic vehicle that has been repaired or rebuilt is ready for a substantial test? Well first you follow the steps in the theory of concentric circles found elsewhere on this blog. Those steps suggest that you should increase mileage in incremental fashion in a radius around the main garage. However, there are times when you need to decide whether to take a leap that is not exactly incremental. Such was the case here, where an opportunity for a 220 mile round trip presented itself when the previous longest distance was about 40 miles. Roll the dice, or take the safer alternative? The drive started out in ominous fashion. Barely 20 miles in, and blue smoke was billowing. Out behind the car. Oh well, I thought, at least it happened close to home, and we could get back in time to take the safer option. After pulling off at the next exit ramp, the smoke had subsided. I pulled into a nearby gas station and began to examine the car. Underneath, it was clearly oil that was falling onto the header pipes and that was causing the smoke. As you know, it doesn't take much oil to produce a heck of a lot of smoke. In the engine compartment, there was no obvious leak or wet spot that seems to be the culprit. A check of the dipstick revealed that the car had not in fact consumed any significant amount of oil. I topped up the oil, and decided to proceed to the next exit. If the smoke returned, I would turn around for home. If not, I would continue. Several exits later, there was no sign of any smoke. indeed, for the entire remainder of the trip, the car was flawless, and there was no smoke, or consumption of oil. 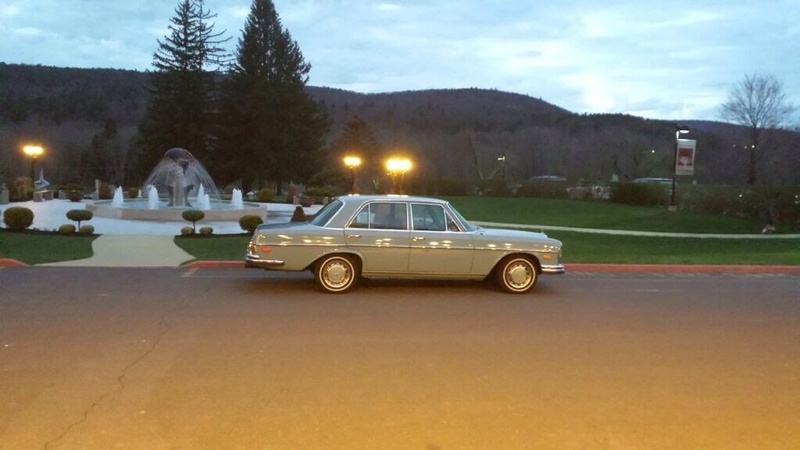 This is the second mystery that has resolved itself with this car, and it is now in the category of reliable vintage vehicle that can be trusted for a multi-hundred mile trip. Plus it looked great at the elegant destination.